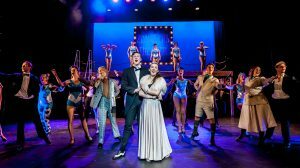 I had to wonder if it was a chicken and egg situation when Trinity Laban’s musical theatre department opted for the Gershwin musical, Crazy For You, as its big summer show for the third year graduating students. Did they pick this deceptively late musical, written in 1992 but based on the Gershwin’s 1930s Girl Crazy, because of its ample ensemble roles – or was it chosen as a showcase for the particular talents of its stars? For undoubtedly, Christian Andrews and Ella-Jane Thomas, are stars-in-the-making, with the tap-dancing, self-assured Andrews a shoo-in for any upcoming dance shows. He was clearly born about 100 years too late. Back in the day Andrews would have walked into Singin’ In The Rain, Me and My Girl or one of the Busby Berkeley blockbusters like 42nd Street. He’s a lankier version of Hollywood nice guys and dancers, Donald O’Connor and Ray Bolger. His style is pure old school tap, immaculately delivered with a smile, a twinkle in the eye, and a cheesy quip. It is uncertain whether he could survive in the cut and thrust world of, say Lin-Manuel Miranda’s revolutionary and inventive musicals, but I’m guessing that, after three years at the London conservatoire, he could probably turn his tap shoes to any dance style. 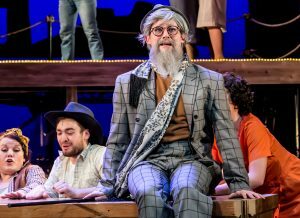 Crazy For You may just be 26 years old but it looked and sounded like vintage Broadway. It didn’t really stretch its cast, there was little innovation or inspiration, but this was a jolly entertaining production featuring some of the best musical numbers ever written – even if the Gershwin songs were filched by them from their other shows. 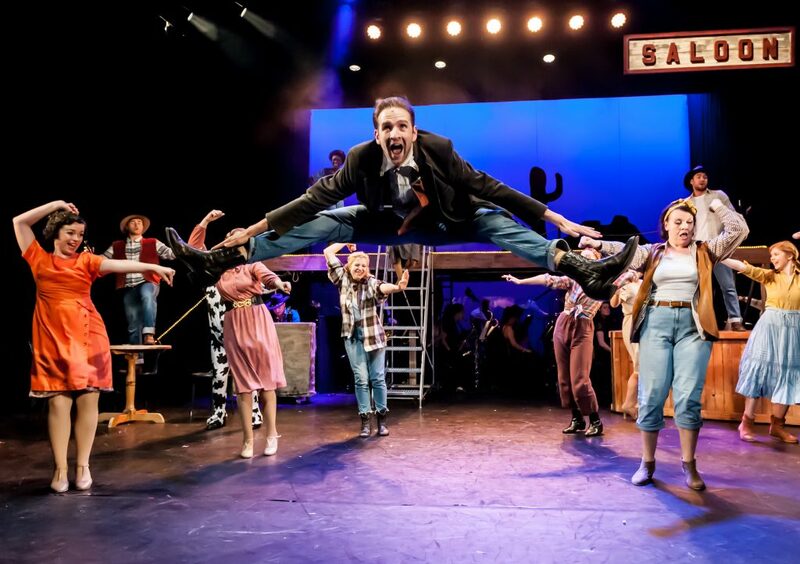 Dammit, I’m still singing I Got Rhythm, days after watching the musical, which swept into Stratford Circus for four performances on Friday and Saturday. Tony Castro directed a sensational student orchestra, live on stage, which opened the night with a terrific Overture. 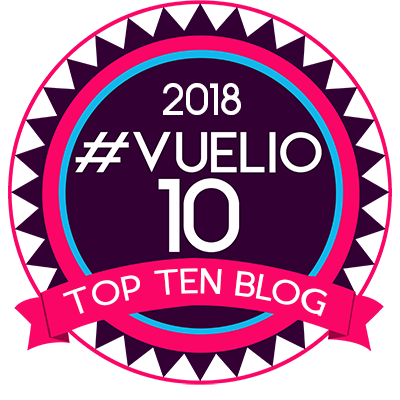 Then we were entranced with impeccably played classics including K-ra-zy For You, Shall We Dance, Embraceable You, They Can’t Take That Away From Me and But Not For Me. Andrews played New York banking heir Bobby Child who was more interested in auditioning for Broadway producer, Bela Zangler, than working in the family firm. But, after fluffing his one big chance, he is forced back to reality. His domineering mother demands that he go to Dead Rock, a hick town in Nevada, “The Armpit of the American Midwest” (population 13 and a cow) to foreclose on an old theatre-turned-post-office. Meanwhile the yokels have heard that the city big shot is on his way. Needless to say he doesn’t get a warm welcome when he stumbles into town after a ten-mile hike through the desert from the nearest train station. He claps eyes on the theatre owner’s feisty daughter, Polly (Thomas), and – ping! – he’s in love (the sap). Unfortunately she gives him short shrift and his only recourse is to pretend to be Zangler, recruit his dancing girls into the rouse, and try and save the theatre with one big community-driven show…as you do. Intellectually challenged singing cowboys Moose, Mingo and Sam (Phillip Murch, Alex West and Daniel-Thomas Forster) offered good value for money as they blundered their way through rehearsals, bar fights and scenes. The cowpokes weren’t the brightest but the trio generated lots of laughs with their endearing performances. And, of the Zangler dancers, Becky Stockley, as Tess, looked slick and professional, way beyond her years and (non existent) pay grade. Harvey Westwood made the most of the plot’s token bad guy, the saloon owner, Lank Hawkins but lacked conviction to be really intimidating. Director Sarah Redmond included a brief homage to 42nd Street, with a chorus line tapping behind a partially lifted curtain, and added playfulness into the script with oddball sound affects, often at inappropriate moments. 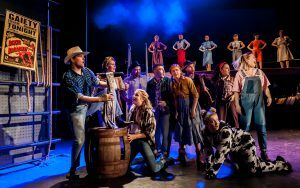 It probably wasn’t what the actress expected after spending three years studying musical theatre, but the cow turned out to be a winning part for, I think, aspiring actress Lizzie Burgess (the cow is uncredited so I’m hoping I have the right name). She was in pretty much every scene, only uddering a few pertinent and thought-provoking lines about art and theatre, yet contributed a lot of subtle, off-the-wall, humour with a great physical comedy performance. There was a lot of talent on show during the run and, I’ve been told, most of the year group has already found representation, which is great news. This cheeky, heartwarming, feelgood, musical came complete with a few sound issues, particularly for the vocally brilliant and beguiling Ella-Jane yet she overcame them like a pro. A fun show with standout turns from its bold cast. Review. 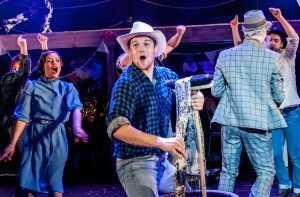 Christian Andrews & Ella-Jane Thomas reveal their star potential in Trinity Laban’s Crazy For You, a showcase for its talented, graduating, third year students.